Alex and Supergirl confront the AI simulacrum of Alura, for information on Facet. Facet was a guard on Krypton, with diamond hard skin. Kara comes to believe that Alura sent Facet to watch over her, and the resulting conflicts have stemmed from that decision. Kara sits pensively, uncertain of what move to take next. Story - 4: Aside of the ridiculous notion that Supergirl can override the programming of an AI, simply by becoming frustrated with it, Gates turns in another solid instalment. 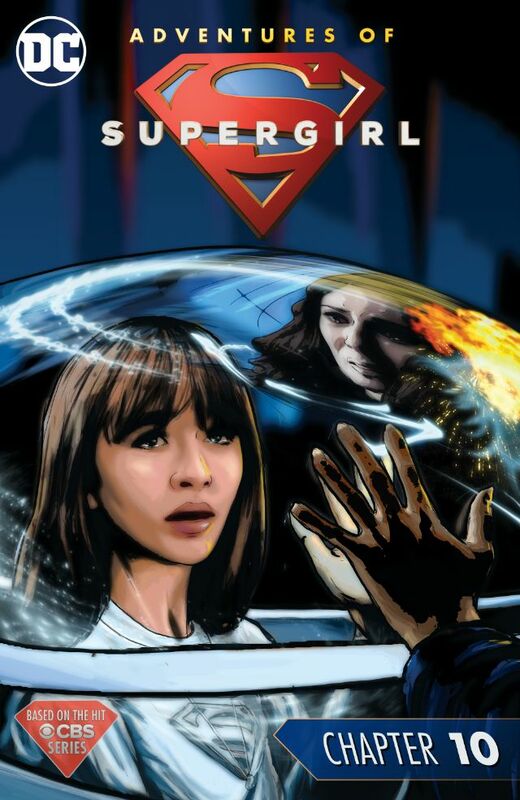 Readers of Gates' run on Supergirl will not be surprised at the complexity layered into each chapter, and how Gates has taken Supergirl from the light, easy-breezy beginnings in Chapter 1, to the contemplative figure who sits in hard thought in Chapter 10. Supergirl brooding in a foreign site, but with the twists and turns of the storyline, a moment to apply some much needed thought to situation Kara has to deal with isn't cliche or stifling. Much has been made of the darkening of characters, but Gates understands that the darkening of the story doesn't necessitate the darkening of the character. Art - 2: The art comes across as nearly experimental, a vision in water colors, and utterly unappetizing. Cover Art - 3: See the above.